Recently, two great new buildings that serve the arts have been unveiled in the UK and both of these structures have employed glass generously in their design. 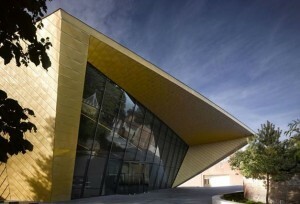 In Colchester, Firstsite is a major new centre for the visual arts. Designed by acclaimed architect Rafael Vinoly it features sharp angles and a large rectangular glass front. Incorporating the Roman heritage of the city, the site is bounded by an original Roman wall and also features the newly restored Berryfield Roman Mosaic at its heart; Firstsite is a fine example of a modern building complementing its historic surrounds. The main function of the building is that of a gallery and the large glass facade was installed in order to ensure that the sites multiple display rooms were illuminated by natural light. Costing £26 million to complete, the gallery is expected to attract half a million visitors a year and is also going to provide a crucial learning space for children, students and local people who are keen to get involved with the arts. 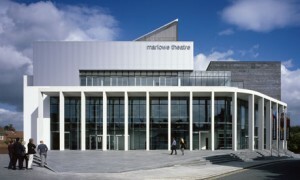 Further south in Canterbury the brand new Marlowe Theatre, that is set to be opened by Prince Andrew early next month, is a distinctively modern building with character. The brainchild of Kenneth Williams the theatre features multiple edges and contains a wide variety of concrete shapes that allow for it to stand out as a modern design with something to say. Like Firstsite, the building also features a large glass facade that draws light from the outside and illuminates the entrance hall, even on a gloomy day. Both of these buildings highlight how glass can be incorporated into less traditionally shaped buildings and reveals the reliability of the material as a building product. Here at Pilkington we have a wide range of glazing solutions that can be deployed and installed into the most challenging specifications, just like the buildings profiled here. For a full and detailed look at the glass building products we have to offer make sure you visit our website.